* AP / Artist Proof prints are priced separately, call for info – (519) 735-7779. Prices are also subject to change based on after-market availability and do not include shipping and handling. Media Size Choose an option24" x 30"30" x 40"
There they were, sitting across from a great legend, looking up and down as his delicate hands holding a model war hawk moving it through the air. A hero today recalls his aerobatics battles for freedom. A short story is just one of many told by a World War II veteran’s. The Second World War was the most widespread and deadliest war in history, involving more than 30 countries and resulting in more than 50 million military and civilian deaths. Only three volunteers P40 Tiger pilots are known to be alive today. Between them, they’re carrying the legacy of one of the most fascinating stories of World War II. This special painting decorates Motor Marc’s tribute to the veteran heroes of the Arm Forces that allows us to have our freedom. 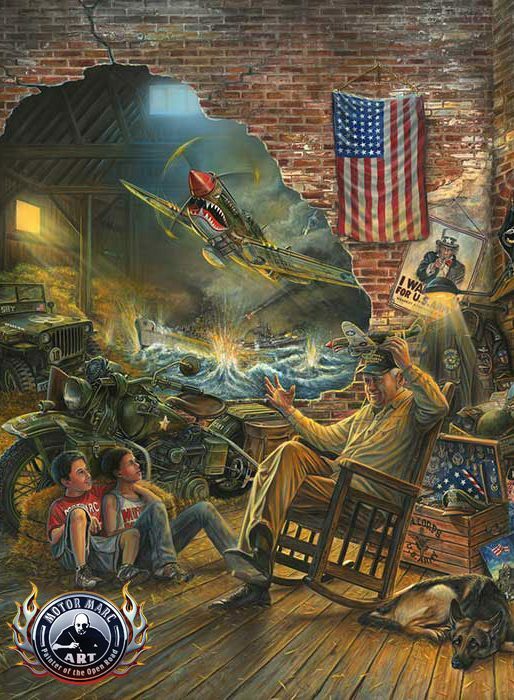 A portion of the print sales will be donated to the ROLLING THUNDER ORGANIZATION and military families in need.